The Communications Office is a part of the Stetson University Marketing division and the primary source of current and accurate information about Stetson University College of Law. 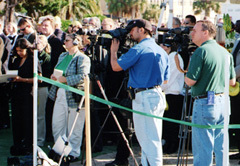 Public and media relations: We connect journalists with legal scholars, publish news releases, manage crisis communications, and spread the word about Stetson University College of Law. Creative services: We develop integrated marketing campaigns, including graphic design and editorial services for print, broadcast, online and paid media. Online communications: We manage the Stetson Law website, StetsonConnect intranet portal, official Stetson Law social media channels, and email marketing and newsletters. For general assistance, email communications@law.stetson.edu or call 727-562-7398. For media inquiries, please email palmer@law.stetson.edu or call 727-562-7381.